When I found out that my Level 2 IMBA Certification was going to take place almost entirely in a grass field, in a crowded urban area, I have to admit: I was a bit disappointed. After all, part of my love of mountain biking is new trails, getting out in nature, and having an adventure. Another part of my love of mountain biking: hopping over that awkward log faster than ever, plunging down that steep descent with confidence, and feeling both tires drift ever so slightly as I carve a corner faster than I ever thought possible. I went into my Level 2 course with cautious optimism- was this going to be rehash of boring basic stuff I already new? Could I really learn new things from world-renowned instructors in a grass field? We were getting back to basics-- and practicing them repeatedly in a controlled environment--under the trained and watchful eye of colleagues and instructors. The smallest bits of instructor corrections helped me elevate my bike lift (with flat pedals!) from 6" to 18" in a matter of seconds. In seconds, my front wheel lift went from "enough to get over a log" to "which truck bed should I put my front wheel into?" In a matter of minutes, my fast cornering form changed in such a subtle yet important manner that I could literally hear my tires gripping the ground differently-- and I was taking a tighter arc, carving, better than ever before. Really, the difference was audible! I developed muscle memories that I am now putting to practice every time I ride singletrack! Repeated practice and objective feedback will make you a better rider! Practice and corrections from trained instructors can help you identify a key nuggets of information, and develop new muscle memories, that you can deploy and practice on every singletrack ride! 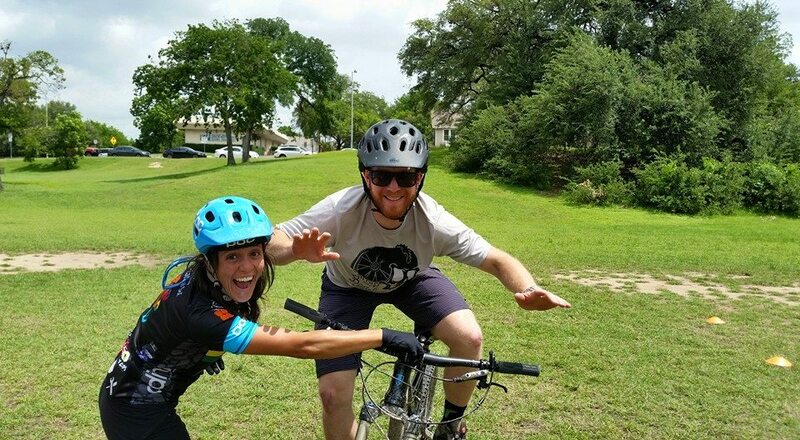 We've spent days studying books of information about mountain bike fundamentals. We've practiced breaking down complex moves into simple, fundamental moves that can be practiced and experienced in a variety of ways. We've spent hours identifying subtle errors in rider form, and how to correct them. I've personally experienced how subtle corrections can lead to super fun improvements in riding. And we've been certified by world cup level coaches to share what we've learned. I'm excited for you to ride better, faster, smoother-- and have more fun! Hope to see you at our Ride Right MTB School!